By David Levithan, published by HarperCollins. Goodreads Synopsis: Danny isn’t used to having something in common with Elijah, however slight. Their last name is the rope that ties them together. Can one girl remind them of want it means to be brothers? 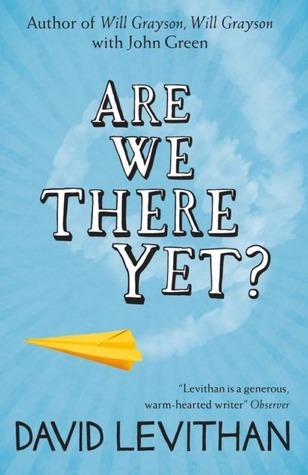 My Review: Are We There Yet? is a very interesting read, that I really enjoyed. It was original and thought provoking, though some points let it down a bit, I think… though it’s probably not the same for everyone! The story starts with two brothers- Danny and Elijah. They’re like Yin and Yang. They’re the opposite. And then they’re both flown off to Italy together by their mum, who claims she and her husband can’t go because of his bad leg. Though it’s obvious that she just wants them to bond! From realising that, I could just tell that this novel was going to be pretty tense- and I was right. Scenes between the two brothers were most often very awkward and tense, and while it was pretty funny at points, it dragged out and slowed down the pace by a little in others. I got the wrong idea of the book at first: The plane journey to Italy took up a good few chapters, and including the two boys getting to know this girl who sat with them. I thought that the whole book would be that one plane journey, and that girl as the love interest, but then Levithan shocked me by dropping her and introducing another, in Italy! As the story progressed I honestly had no idea where the plot would go. Danny and Elijah were portrayed with such different personalities that I found it hard to decide who Julia, the said love interest, would end up with by the end of the book. The ending to the love story woven into the tale of friendship was really quite shocking! The writing style was a bit too unfamiliar for me. I’ve read books in the present tense before, of course, but this carried some real simplicity to it. There were no vivid descriptions, no detailing- the story was just stripped down to the actions and the speech. Whilst that made for a really different reading experience, I also ended up reading a bit too fast, as I couldn’t really match the pace of the short (sometimes, line-long) chapters! I suppose it’s a great read though, for if you’re traveling like Danny and Elijah: The chapters are short and manageable- you could fit time to read them in any day! Danny is a businessman. He’s always looking for potential work, and even on holiday, he’s desperately checking everything to make sure nothing has gone wrong without him, in America. Elijah, on the other hand, is such a different person. He’s a carefree guy, younger than Danny, who hangs out smoking with friends frequently. David Levithan has made it so hard for me to choose a favourite character! Both of the boys had such loveable things about them, but things you could hate them for too. I think Julia had to be my favourite character, in the end. She was unique, and reminded me a little of Alaska from John Green’s novel! Overall, Are We There Yet? was a very unique read, that I enjoyed reading. Although I found the writing style a little unusual, it suited the book perfectly. The characters are all really unique, and I loved following their adventures and love story in the rather romantic setting of Italy. The plot was great- original, hugely entertaining, and carried heart-warming themes of being brothers and how one girl can bring two brothers together in unexpected ways. I’d really recommend it as a holiday read! I received a copy of Are We There Yet? from the publisher, in exchange for a review. In no way at all did this affect my thoughts. This entry was posted in Uncategorized and tagged contemporary, family, romance, travel on September 3, 2013 by keithbwalters.